The Miller School Counseling Program has added some new faces and roles! Sarah St. John will be the School Counselor for all of 6th grade and A-L of 8th grade. Kelly Rottman is a new School Counselor joining us this year and she will be a School Counselor for 7th grade and M-Z of 8th grade. 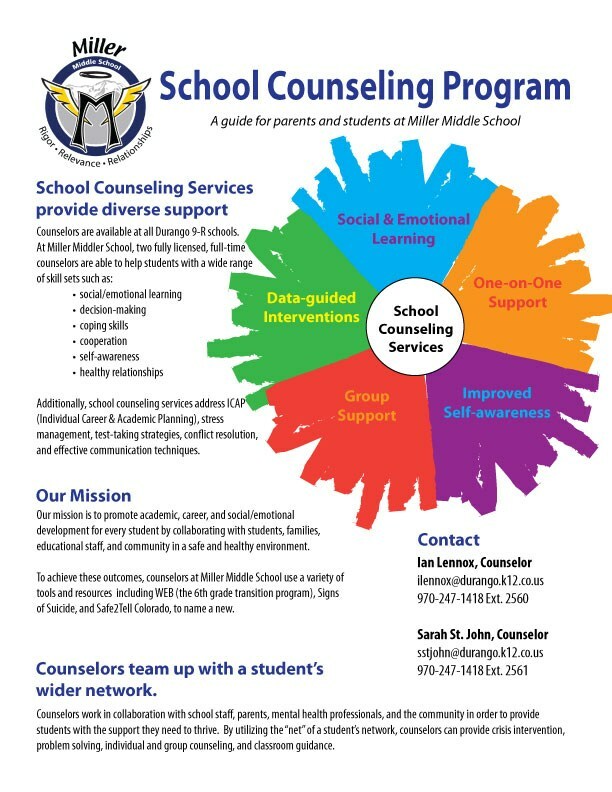 Miller School Counselors deliver comprehensive school counseling services to students which include social emotional classroom presentations, individual and group counseling services, crisis counseling and responsive services, and other school counseling related programming. You can contact Sarah St. John (6th grade and A-L of 8th grade) at 247-1418 extension-2571 or sstjohn@durangoschools.org. You can contact Kelly Rottman (7th grade and M-Z of 8th grade) at 247-1418 extension-2561 or krottman@durangoschools.org. Please like us on Facebook at Miller School Counseling Program to stay up to date on any parenting information or activities we share for you or your students!